If you are looking for a song to add to your Valentine’s Day Playlist, “In a Sentimental Mood” from jazz legends, Duke Ellington & John Coltrane fits the bill. Edward Kennedy “Duke” Ellington was an American composer, pianist, and bandleader of a jazz orchestra, which he led from 1923 until his death in a career spanning over fifty years. He gained a national profile through his orchestra’s appearances at the Cotton Club in Harlem and during the 1930s touring Europe. Ellington wrote more than one thousand compositions and his extensive body of work is the largest recorded personal jazz legacy, with many of his works having become standards. John “Trane” Coltrane was an American jazz saxophonist, composer, bandleader, and iconic figure of the twentieth century. He revolutionized the genre with his technique, termed “sheets of sound” and helped pioneer new beginnings in jazz. Coltrane’s ability to create an emotional connection between the mood, the music, and the listener kept him in the spotlight until his untimely death at the age of 40. During the final decade and a half of Duke Ellington’s life, he become more and more creatively productive. One of the key elements of this was showcasing the progression of his own personal compositional stamp-evolving elements of it to adapt to the new sounds of the decade in which he was creating. Part of this involved willing collaborations with some of the newest musical innovators in jazz. And few were making more abrupt innovations in their instrumental approach to playing in the early 60’s than John Coltrane. “In a Sentimental Mood” is a stroke of brilliance. These are two of the giants of jazz, and the music they make together is sublime. Combining the talents of Duke Ellington and John Coltrane elevates this music into a new category, making it not only music, but also a piece of history. Duke Ellington’s angelic piano touches are set to John Coltrane’s velvet-smooth sax during this gentle number. It’s a timeless classic from two music innovators that will play on into the ages. 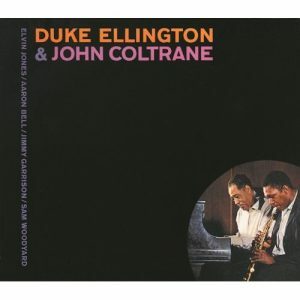 Of the cluster of albums Duke Ellington made during a between-contracts period in the early Sixties, the collection of songs with John Coltrane is pure magic. In love, or out; We hope you enjoy the very cool sounds of Duke Ellington & John Coltrane.